HIGHLIGHT #1: Not having to cook while enjoying spectacular food. The Old Rittenhouse Inn’s Landmark Restaurant is known for its spectacular food, enjoyed from dining rooms overlooking Lake Superior and Madeline Island. A scrumptious breakfast is part of all lodging, served in the dining room in two courses. Dinner can be enjoyed as a five-course set-price meal or guests can order a la carte from the menu. Treat yourself to meals of gourmet deliciousness, full of conversation, all while taking your time and savoring each bite. Bayfield offers a variety of restaurants from the great burger joint to pizza, pasta, and tapas venues. Fresh Lake Superior Lake Trout or Whitefish can be found in abundance throughout the year. Berries and fruit are in abundance during the summer months from the area’s local orchards – perfect for even the most discerning of pregnancy cravings. HIGHLIGHT #2: Just sit back and rest, we’ll take care of the pampering details. Relax and watch the world go by from the porch of our Bayfield, WI bed and breakfast or our sister property, Le Chateau, while you sip on a cool beverage and nibble on a fruit and cheese plate. Ask one of the Old Rittenhouse Inn staff to assist you in booking a massage in town, or opt for an acupuncture or facial from one of Bayfield’s spa venues. For the romantic, the Old Rittenhouse Inn offers a Romance Package with fresh flowers, sparkling wine (non-alcoholic available), chocolate dipped strawberries, and a voucher for the Landmark Restaurant. Feel pampered, relish the quiet time, and soak in the conversation with your partner or you favorite new book. If shopping is part of your personal pampering routine, know that Bayfield offers a variety of unique shops from used books to jewelry, clothing, gifts, and everything in between. Meander through the quaint shops, pause for a decaf latte or a delicious ice cream cone, take in the sights and then head back to the shops for those one-of-a-kind treasures. HIGHLIGHT #3: Be as adventurous (or not) as you wish! Reading and relaxing and napping and eating may be all you are looking for on your babymoon. For the action-seekers, hiking, kayaking, boating, golfing, biking, and other outdoor activities are only a short walk down the hill. Whatever your desired activity levels, Bayfield and Lake Superior can deliver. You choose the option on the range of passive soaking in to active tackling of rigorous action, no matter what the season. HIGHLIGHT #4: Natural beauty and fresh air do wonders for the mind and body. The healing power of Lake Superior has been sought by many for as far back in time as the influence of fresh air and natural beauty were recognized. Whether you choose to be on the lake, in the lake (brrrr!!! ), or near the lake, it’s hard not to recognize the calming effect the water can have on you. Take in the views from your room at the Old Rittenhouse Inn, breathe in the fresh air and soak in some sunshine on an Apostle Islands Cruise or an afternoon sail with Dreamcatcher Sailing. Power your own kayak alongside a guide from Living Adventure or experience the thrill of being pulled through the quiet, snow-covered woods by a pack of sled dogs whose only desire is to run, courtesy of Wolfsong Adventures in Mushing. Quiet hikes in the hillsides of Bayfield and beyond or trekking through the woods to picturesque views of Lake Superior and the Apostle Islands are all within reach here. HIGHLIGHT #5: Cozy relaxation at its best. When winter comes around, things slows down a bit in Bayfield. If your Wisconsin babymoon escape is planned for November to April, picture yourself in front of a cozy fire with a good book, your sweetheart, and chocolate dipped strawberries within reach. Perhaps your doctor approves a soak in a not-too-hot whirlpool. Or relish a prenatal massage for you and your partner. Dinner for two near a window overlooking Lake Superior can provide additional time for baby adventure planning or just a chance to catch up. We provide the ultimate Wisconsin getaway. 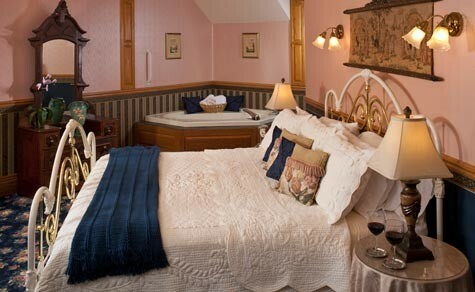 The staff at the Old Rittenhouse Inn has your comfort and enjoyment top of mind. We are happy to make sure your visit to Bayfield is one you will always remember. Let us know how we can help you plan and enjoy an unforgettable babymoon as you prepare for the arrival of your little bundle of joy. Does your idea of a relaxing vacation include playing a round of golf with gorgeous views of Lake Superior? Old Rittenhouse Inn partners with Apostle Highlands Golf Course to offer a “Stay ‘n’ Play” lodging & golf package allowing you to experience breathtaking Bayfield golf with views of Lake Superior and the Apostle Islands. Old Rittenhouse Inn’s Golf Package is valid anytime during the season. This convenient package allows you to enjoy 18 holes with a cart during your stay at Old Rittenhouse Inn, Le Chateau, or Rittenhouse Cottage. Imagine waking up to a delicious two-course gourmet breakfast, complete with coffee or tea and fresh bakery, then heading out for a 18-hole round with 13 holes facing Lake Superior and the Apostle Islands. Apostle Highlands is located 500 feet above town, on the top of the Bayfield Peninsula with the dazzling blue waters of Lake Superior, Chequamegaon Bay, and the picturesque Apostle Islands National Lakeshore below. These panoramic views enhance the excellent par 72, 18-hole public golf course. This wooded hilltop course is surrounded by mature maple, oak, birch and conifer trees. In the fall, golfers love to play in a blaze of glorious color, though the course is beautiful any time of year. The first hole even gives you the opportunity to tee off over Lake Superior and features a small-scale replica of the big lake itself! So how good are the views, really? In a word, spectacular. With over 250 wooded acres Apostle Highlands offers breathtaking Bayfield golf with views of Lake Superior, Madeline Island, Long Island, and Northern Michigan’s porcupine Mountains are even visible on a clear day. 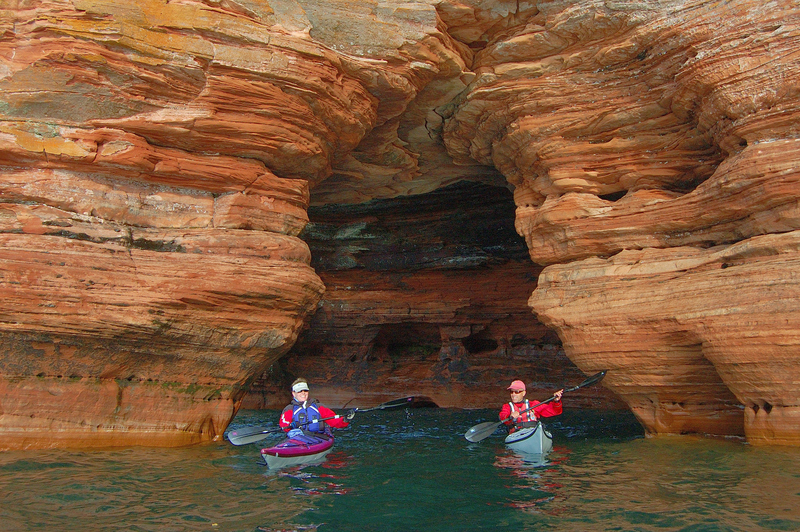 Sea Kayaking is one of the best ways to get out among the Apostle Islands in Lake Superior. There are several area outfitters who can put you onto some world class kayaking between May and September. If you’ve never been to the Inland Sea Caves north of Bayfield, (also known as “the ice Caves” when the area freezes in winter) one of the best ways to get up close is via kayak. There are several caves in which, on a calm day, you can paddle right through the caves to daylight on the other side! Old Rittenhouse Inn offers a special kayaking package together with our partners at Living Adventures. This package takes all the work out of your vacation planning with just a few clicks. If you prefer, you can always call us at 715-779-5111 to discuss arrangements. Our family loves to kayak, and though our summers keep us very busy here at the Inn, we always make a point to get out at least once a year and enjoy a paddle on the big lake. I can remember one of our first kayaking experiences where we rented a 3-seater, with Wendy in front, me in back, and our daughter Kyra in between us. We paddled out from Big Bay Town Park Beach on Madeline Island, and headed for “the point.” it was a relatively short distance, but the wind was blowing in our faces and the paddle was somewhat difficult. Our daughter, then about 4 years old, began to complain: she wanted to go play on the beach. We told her we’d soon turn around and head back. Enjoying the great weather and easy paddling, we continued on, past some brownstone cliffs I wasn’t sure if I remembered, and finally came upon some sandy beaches with houses and cabins on them. At this point, I realized that we had over shot our landing… by a long way! It was sunset when we finally returned to the beach. Thankfully Ed Kale from Apostle Islands Kayaks had waited for us. Ed drove us back to LaPointe, and we all had dinner together before catching the ferry home. My daughter was quite unhappy with the whole experience because she never got to play and swim at the beach! So if you are not very experienced, make sure to pay attention to the advice of your outfitter. For more information about experiencing kayaking on Lake Superior, call our helpful reservations crew at 715-779-5111 or reserve online here.